A good knife is very important when cooking. I have a couple of go to knives in my kitchen and I was happy to add a new one, Sabatier 7 inch Santoku Knife. Sabatier has a rich history dating back to 1812 in France. You can read all about their heritage here. I don't have a Santoku knife so I was curious how it would compare. It is smaller and lighter than my Chef's Knife. I've been testing it out for a couple of months using it for just about everything. I have three knives that I use regularly in my kitchen. A Santoku knife was a new addition. The blade of a Santoku knife differs from a Chef's Knife. 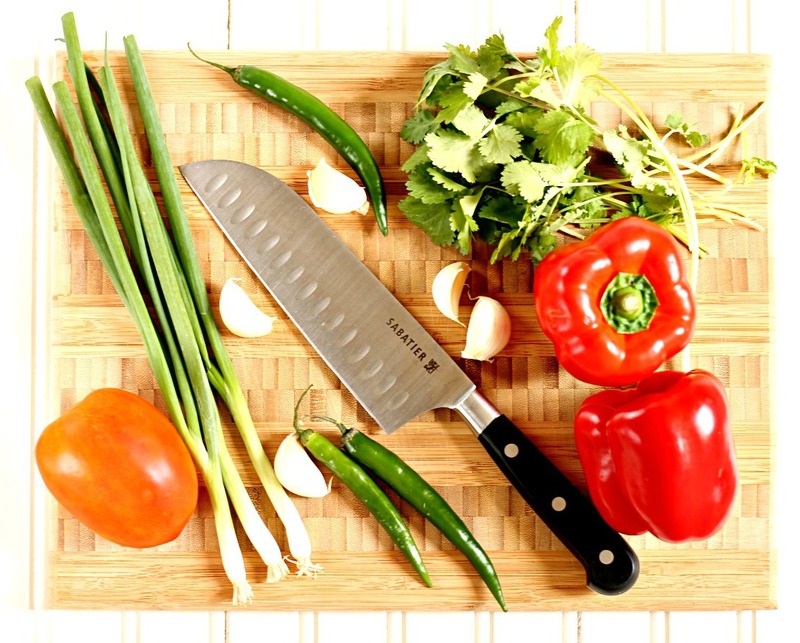 It is straight and useful for chopping whereas a Chef's Knife is perfect for a rocking motion while using. My first instinct was to use the Santoku Knife in the same fashion as a Chef's Knife so initially I wasn't too pleased with the results but after reading it is not designed for a rocking motion, I changed the way I was using it and things started to improve. My first use was to mince cilantro as it is something I use just about everyday in my cooking. I immediately noticed I was not getting a good mince. After sharpening a couple of times, it was much did a much better job. I liked how light this knife is and enjoyed using it for chopping. For mincing I prefer my Chef's Knife. I wished that the knife came sharpened well. Overall it is a good multi-purpose knife. If you would like a chance to win a Sabatier Santoku 7 inch Knife, please use the Rafflecopter below to enter. This giveaway is open to Canadian residents only. My chefs knife is my favorite piece of kitchen equipment. I didn't know there was a method to mincing! Wow! You learn something new everyday! I love a good paring knife! 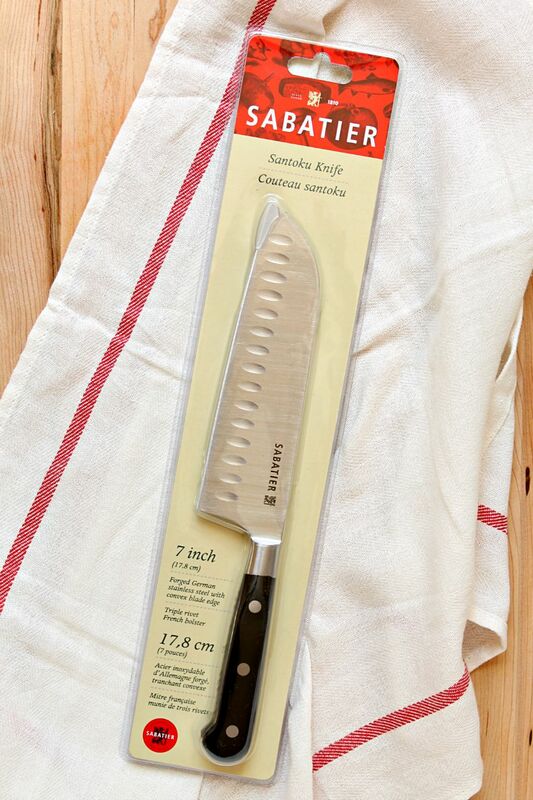 I've never used a Santoku knife but would love to try it. My favourite knife to use is probably my Chef's knife, although a close second would be my paring knife. My favourite type of knife to use is a really good paring knife. I normally use a simple paring knife for almost everything. I like the chef knife and my santoku knife. I like to cut veggies with these knives. I really like chef's knifes, and need a new one! I like to use a chef's knife. I like a good chef's knife because they're so versatile. A paring knife. It is what I use the most. my paring knife is what I use most. This looks like a great knife though! I just grab the sharpest and closest one that will do the job! I usually use a paring knife the most. I use a paring knife the most. I quite enjoy a good paring knife! I have a small paring knife that I really like using. I wish I could say I even knew! lol ... I just use whatever comes in a knife block and I'd love to upgrade!